Justin Trudeau and his Liberal government announced a number of additional steps and additional time to Canada's widely ridiculed National Energy Board [NEB] review process a couple days ago and i've been reading as much as i can about the details from both proponents and critics of Trudeau's new scheme. Many times during the election campaign last fall Trudeau promised that he'd overhaul the NEB while also saying that one of the jobs of a Prime Minister was to help resource industries get their products to market. 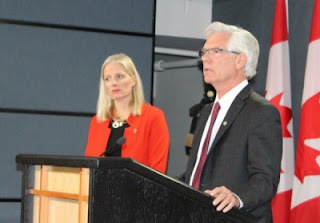 Also unfortunately, during the announcement ceremony by cabinet ministers Carr and McKenna by Trudeau himself, we've heard countless versions all saying: "..that their main goal is to find a regulatory mechanism that will permit the approval of the pipelines." Which sure sounds like they've already reached a conclusion, now all that's left to do is justify it. 5.Direct and upstream greenhouse gas emissions linked to the projects under review will be assessed. As i see it, the minute the Liberals [or any government] changes the review process in mid-stream they are opening the door to both lawsuits within Canada and, more importantly, NAFTA challenges through its damned ISDS mechanism. The Liberals are apparently trying to avoid this NAFTA challenge by not returning ongoing reviews to "square one". They are trying to appear to fulfill the Tsilhqot'in decision's ruling that they must consult and accommodate those FNs. Consulting ENs that have signed treaties by sending in vassals to listen changes nothing. Those FNs who haven't signed treaties have the right to refuse to accept the govt. at which time the govt/s simply has to go to court and prove that the project under discussion is in the 'national interest' [ a totally subjective point]. On the other hand changing the review process in mid-stream, does have serious, objective and adjudicated consequences. IMO, instead of this new interim process making the situation more fair, it makes it less. Now Kinder Morgan's lawyers have a built in reason that they can launch a NAFTA appeal on if the Liberal cabinet denies their application. They'll just say 'we did what was demanded by the process we signed up for and we invested a lotta money doing so'. This logic is very little different from the logic TransCanada is using in it's NAFTA challenge against the US for its rejection of the KXL. So this interim process, designed to make opponents feel loved, is basically a guarantee for Kinder Morgan that in the end, though that 'end' will take a few extra months, their pipeline will be approved. i wouldn't be surprised if someday an FOI request or ? proved that the Liberals have already made a deal with Kinder Morgan to keep quiet as part of their guarantee of eventual acceptance of their pipeline. The Trudeau Liberals go on to assure us all that whatever decision they reach after gathering all this new info from the consultation process, the existing NEB process, science, traditional knowledge of Indigenous peoples, the views of the public and affected communities and other relevant evidence, will be decided by what they consider to be in the 'national interest' - which is totally subjective. For instance, right now the chant of jobs, jobs, jobs seems so loud it would trump all others but in the fossil fuel ending long-run where Canada has pledged to keep GHG emissions low wouldn't almost all those jobs be eliminated, won't Canada's future employment be in 'green' jobs like conservation, efficiency, sequestering carbon through prairie restoration and small scale organic farming? Wouldn't the national interest be better served by retraining most of those losing fossil fuel industry jobs? The reality is that whatever information is placed before Trudeau's cabinet they will decide the KM expansion is in the 'national interest' both because as elite Canadians they will, like most all humans, cherry pick those bits they like and reject those they don't - it's called confirmation bias. Who knows what will happen in reality, the Canadian cabinet could grow a set of cajones, they could reject China's demand that Canada must build a pipeline to the west-coast, they could just abrogate NAFTA...but they won't they'll approve the idiotic Kinder Morgan twinning not because it's in the 'national interest' but because it's in their own short term best interests which is getting re-elected in 3+ years from now.